- Visit our Gallery Pages to see lots more photos of Olympic Peninsula steelhead fishing. 'Fill the bottom of the shower with ice cubes, step in, and turn on the cold water as much as as you can!' is a oft-told saying depicting a day of winter steelhead fishing. While the weather is usually less than perfect, it rarely fits this description. While your trip will likely NOT resemble a hop into a sauna, if you dress appropriately, it isn't all that bad, especially in the latter part of the season. Most of our conventional tackle fishing takes place from the boat, which does have a nice propane heater for you up front to help keep you comfortable. Rico gets to see the meaning of 'two-tone cruiser' close up! Just remember to dress in several layers (the boats have dry storage if you want to take something off), and come prepared for rain. Waterproof footwear is highly recommended. Our winter highs are usually in the low 40's, rising to the low 50's by March. Traveling by an 'oar-powered' 17 foot driftboat or custom raft, you will float through the numerous pools, runs, and rapids (class III+ on some of the floats) of the rainforest river valleys. While there are numerous deer, elk, bear, and cougar in the area, glimpses of these critters are infrequent. However, we usually see lots of Bald eagles, herons, Harlequin ducks, and river otters on our floats. A little fun in-between fishing holes! Depending upon the time of the year, we will usually meet well before sun-up at a local restaurant for breakfast and then head out to the river. 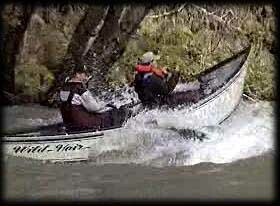 Which river we choose to fish depends upon water flows, time of year, tackle choices, and river traffic. Through most of the season, with an early morning start, we will fish until mid-afternoon, unless we are catch-and-keep fishing for hatchery fish, in which we will finish up when we limit. All of your tackle is provided, or feel free to bring your own if you wish. Just let us know when you book and we'll be happy to make recommendations. 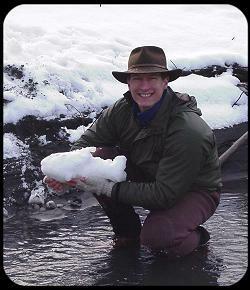 All you need are warm clothes and a fishing license (click here for info). We run only the finest equipment: including G. Loomis, Sage, North Fork Composites (Fetha Styx assembled) rods designed for each fishing application and Shimano, Daiwa, Lamson & Ross reels. 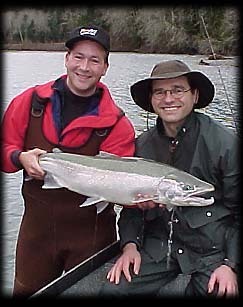 One of the greatest things about steelhead fishing is the opportunity to effectively fish for them with such a variety of techniques: swinging flies, nymphing flies, float fishing, backtrolling, driftfishing artificials or bait, hardware fishing and more! If the fish slides out of your hands before you can get a pic on a snowy day ... improvise! We vary our fishing techniques based upon customer desires and water conditions. We tend to keep things as hands-on as possible (meaning little backtrolling, unless requested). If you'd like to fish a particular way, we're more than happy to accommodate your request where feasible, just let us know. It's YOUR day!